We're so excited, and we just can't hIDE it! CCS has been hard at work improving our IDE Compiler. We can barely hold back our excitement to show our users the enhancements we have made to our IDE compiler to improve their projects. Many aspects of the IDE have been polished to give the IDE a more sleek and modern look and to provide more powerful tools for our users. The Superbar has been slightly re-arranged to emphasize more commonly used items. Our C editor has been updated with instant syntax checking, column editing, smart highlighting and searching with regular expressions. Debugger improvements make it easier to watch complicated variables like arrays and structs. The convenient Statistic viewer graphically displays the percentage amount of program memory, data memory and stack space. 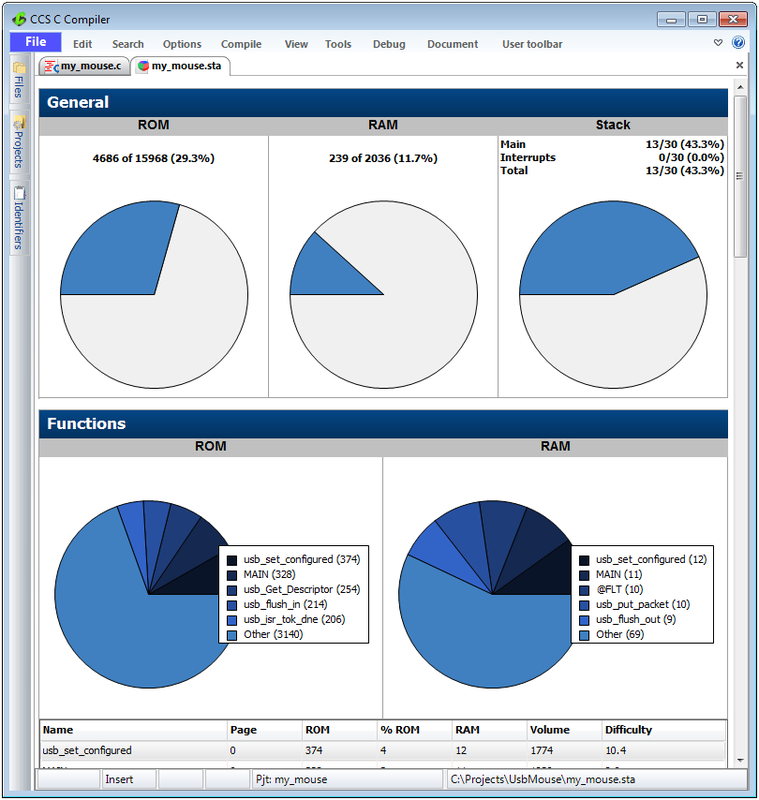 The Functions section graphically shows which functions use the most program memory or data memory in a pie chart. This is very useful for quickly determining which functions the user might need to review if the user is looking for ways to optimize the program to use less memory. 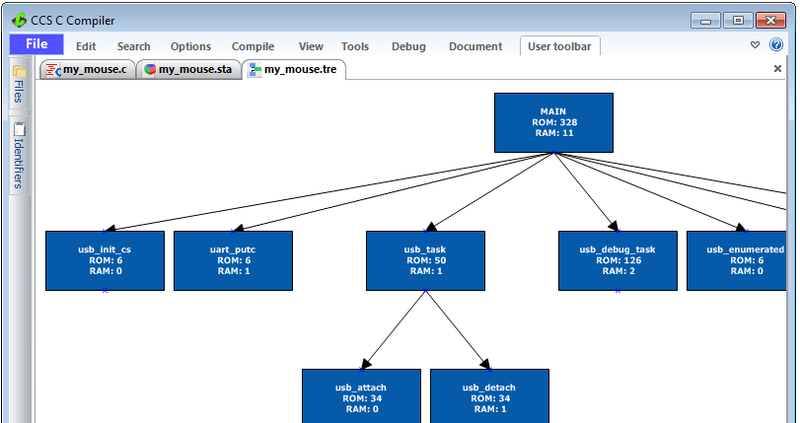 The revamped Tree viewer shows the call tree graphically. Each function of the call tree is represented by a block. Now the user can drag-and-drop the placement of the blocks. It is also possible to hide branches of the call tree and only inspect the calls out of one function. The Editor now has a live syntax checker. Any code errors that would prevent the project from compiling will be displayed with a red-underline under the offending syntax. This check is done live while you are typing. To view the syntax error, simply hover the mouse over the underling. 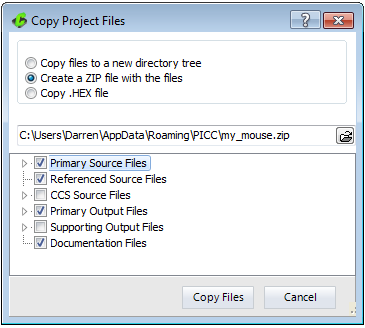 Use our Copy project tool to copy all relevant files in your project to a new directory or ZIP file. 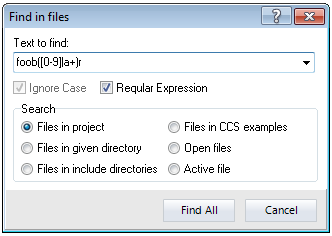 The sharpened Find and Search tool can now use regular expressions. Regular expressions allow the user to enter complex parameters into the search field for matching specific combinations of characters, digits or phrases. In the example screenshot, foob([0-9]|a+)r is entered which would find 'foob0r', 'foob1r', 'foobar', 'foobaar', etc. The Editor has an improved 'Find all References' and 'Find Delcaration' tool. 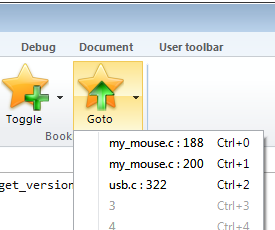 These unique new tools can be selected by right clicking on an identifier in the editor. 'Find All References' finds all the references of this identifier, while intelligently skipping over any commented references or similar identifiers that don't match because of overloading. 'Find Declaration' will find the location where the identifier was declared. The advanced Bookmark tool is now project specific and spans all files in the project. The menu will also show you the locations where bookmarks were set. Our Compile menu now has a new 'Build and Run' tool that will compile the program and program it to the microcontroller with one simple mouse click. 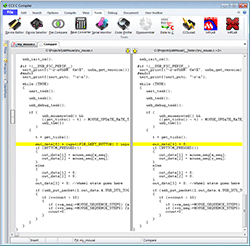 The Editor tool also has a column editing feature. This is useful if there are several lines that start or contain the same block of text but need to be replaced or edited. To use this feature, press the CTRL key on the keyboard while using the left mouse button on the mouse to select a block of text. Pressing DEL will delete that block of text, or typing will replace block of text with new text. Find out for yourself how the new IDE enhancements can strengthen your productivity and get you ahead of the curve on your product development. Take a look at the Version 5 page for additional features that will be in Version 5. Keep your eyes peeled for V5 upgrade specials and deals. Visit ccsinfo.com/enhance to purchase our feature rich IDE Compiler, Maintenance or Upgrade. C-Compiler Version 5 Features - Part one! CCS, Inc. CCSC Version 5 beta testing is underway and we are receiving exemplary reviews from our testers. Due to successful testing we are set to launch Version 5 on the week of May 20th, 2013! CCS would like to thank the hundreds of loyal customers who have agreed to beta testing Version 5. This large response has helped make Version 5 a solid development tool. At this point we would like to provide you with a sneak peek into some of these improvements. 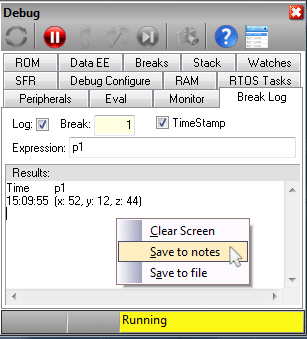 The option to "Save to notes" has been added to the right-click menu of multiple debug windows which will append the selected data (such as break log or RAM data) to the end of the notes file associated to the project. Hovering over any structure or array variable while debugging will now allow you to expand or collapse a pop-up note in the "watch window". Drag and drop "watch items". Have an important watch variable that is in the middle or at the bottom of your watch list? You can now drag and drop watch items within the watch window to reorder them by your preference. Be on the watch, later this week, for part two of the sneak peek! Version 5 is set to launch on the week of May 20th, 2013! Just a reminder: May 16th is the last day to enroll for beta testing. To participate in beta testing and for more information on Version 5 we invite you to visit www.ccsinfo.com/version5. Also be sure to stay tuned for upgrade specials and promotional offers. C-Compiler Version 5 Features - Part two! CCS, Inc. We are excited to announce CCSC Version 5 is set for full release next week! We are in the final stages of our successful beta testing and, over the last few weeks of development, we have added even more features and enhancements to the compiler and IDE. We would like to provide you with one last sneak peek into some of the key features that you will want to try for yourself. Version 5 IDE now supports previous versions of compiler allowing you to choose amongst legacy versions to use. This feature provides for standardization on a specific version based on projects, testing or certifications. Now, with each project, you'll be able to create a "Project Notes" file. This file allows you to create notes pertaining to each project. 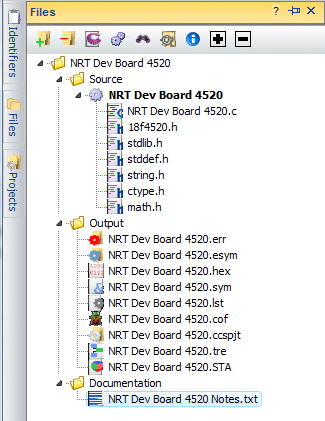 Each of these files can be associated to a particular project via the menu or Files navigation pane. The new "Identifier Explorer" in Version 5 IDE allows for a quick and easy way to view the relationship between program identifiers. For example; which variables and functions are declared in each file, or to see all functions that access a global variable. This screen shot shows for a single function all global variables accessed, as well as, local variables and functions called. The style and functionality of the "Files Navigation Panel" has been improved and simplified. For example; it is much easier to add units, for linking, or to add other C and H files in single compilation unit projects. Version 5 now automatically maintains a history of source code changes. The IDE can be configured to specify how often and how many old files to be saved (maintain old file on every save, once an hour, once a day, etc). 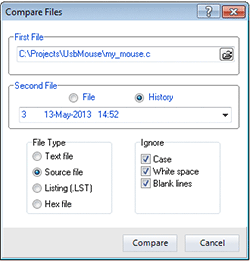 The File Compare utility inside the IDE also keeps this history and allows you to compare a current file to an older file from history. 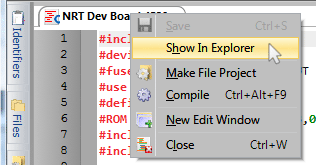 The right-click 'Show in Explorer' is now available on the editor tabs. This allows you to open an explorer window at the destination of the file. Version 5 is set to launch next week! We invite you to visit www.ccsinfo.com/version5 for more information. Also be sure to stay tuned for upgrade specials and promotional offers. The Code Optimizer, has just been released! CCS, Inc. CCSC Version 5 with all of its new features and enhancements has just been released! Version 5 is the first release to include a very aggressive code optimizer, optimizing for space instead of speed. The new optimizer is able to search the entire compiled program to find repeating blocks of code whereby reducing all those repeating blocks into one shared sub-routine. Optimizer is executed during the final phase of the compile which presents the ability to cross a unit boundary when performing the optimization. #opt compress: This new optimization level can be achieved by adding this line of code into your project. This new optimization level is supported on Enhanced PIC16 and PIC18 microcontrollers. The .h file for specific PIC® MCU are now prototyped. 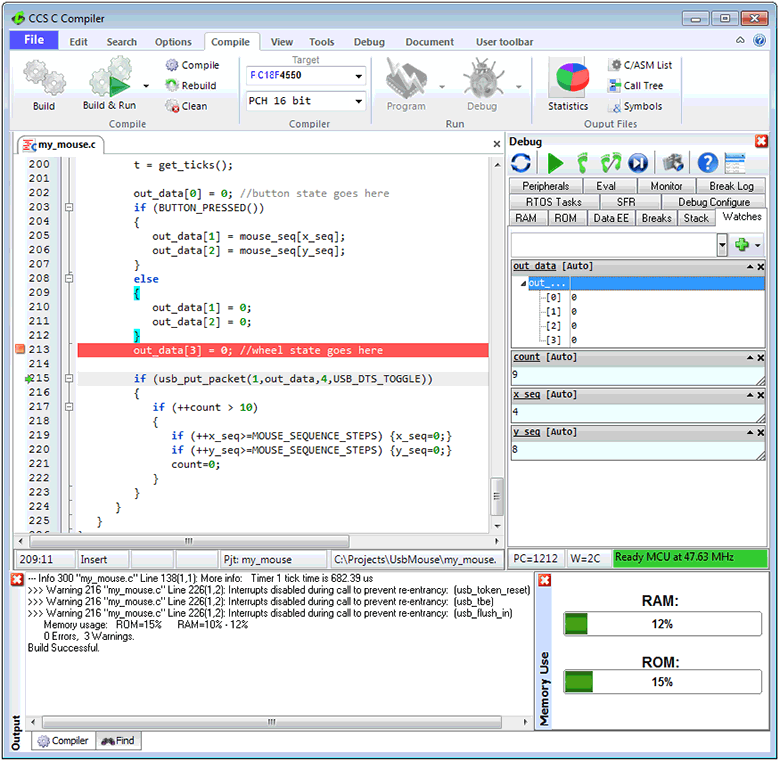 Now included are prototypes of the compiler's built-in functions and data-types. This is useful for programmers using tools that would have flagged the compiler's built-in functions and data-types with an error because they were not defined. A new command-line parameter: sourceline. This now has been added to inject a C source-line into the file being compiled. Usage example:ccsc.exe +FH myfile.c sourceline="#device PIC16F887"
Standard C libraries iso646.h and stdbool.h have been added. Version 5 also includes the following new capabilities: Multiple Compiler Versions, Project Notes, Identifier Explorer, Files Navigation Panel, File History, Show in Explorer, Save to Notes, Mouse-over Watch, Drag and drop "watch items", plus many more. For more information on all of the Version 5 enhancements and new features please visit: www.ccsinfo.com/version5. PIC® MCU, MPLAB® IDE, MPLAB® ICD2, MPLAB® ICD3 and dsPIC® are registered trademarks of Microchip Technology Inc. in the U.S. and other countries. REAL ICE, ICSP and In-Circuit Serial Programming are trademarks of Microchip Technology Inc. in the U.S. and other countries. 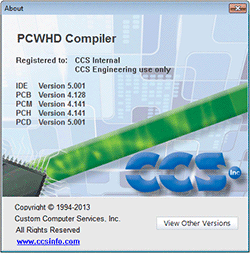 CCSC Version 5 now supports all previous versions of compiler! We know having access to previous compiler versions is essential. We also know that version standardization for project requirements, testing or certifications is also essential. Have peace of mind that now you can accomplish both objectives! Multiple compiler versions can be installed and from the IDE you now have the ability to run any previous version. We invite you to visit www.ccsinfo.com/version5 for more information. Call or email our sales team to learn more about our special promotional offers as well. Like us on Facebook and follow us on Twitter. Slash USB project costs with CCS C Version 5.007! CCS, Inc. Add a low cost USB solution to your next project using CCS C Version 5.007 and PIC16F1459 MCU! CCS C Version 5.007 now supports the PIC16F1459 MCU which is notable for two reasons - it's the first PIC16F with USB support, and now USB can be used with the internal oscillator through the PIC® MCU's active clock tuning(ACT). This eliminates the need for an external oscillator which further reduces your costs while adding USB. CCS, Inc. C Compiler Version 5 supports Microchip's PIC10F®, PIC12®, PIC16F® 8bit peripherals. These peripherals include: Numerically Controlled Oscillator(NCO), Pulse-Width Modulation(PWM), Complementary Waveform Generator(CWG), Configurable Logic Cell(CLC), and Data Signal Modulator(DSM). In a two-part series we will cover these PIC® peripherals within C Compiler Version 5. The Numerically Controlled Oscillator (NCO) module is a new peripheral that is supported by CCS C compiler. The NCO module is a timer used to generate a fixed duty Pulse-Width Modulation(PWM) or a pulse at a specific frequency. The NCO uses the overflow from the addition of an incremental value to divide the input frequency. The advantage of this is that the resolution of division does not vary with the divider value, making the NCO useful for applications that require frequency accuracy and fine resolution at a fixed duty cycle. In part two of this series, next week, we will discuss the new Configurable Logic Cell (CLC) and Data Signal Modulator (DSM) peripherals which are also supported CCS C compiler. 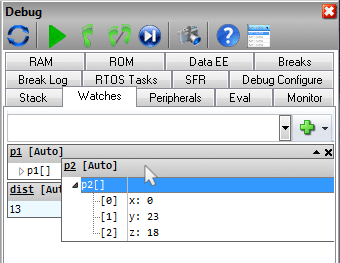 CCS, Inc. C Compiler Version 5 supports Microchip's PIC10F®, PIC12®, PIC16F® 8-bit peripherals. These peripherals include: Numerically Controlled Oscillator(NCO), Pulse-Width Modulation(PWM), Complementary Waveform Generator(CWG), Configurable Logic Cell(CLC), and Data Signal Modulator(DSM). Part two of this series will cover the Configurable Logic Cell(CLC), and Data Signal Modulator(DSM) peripherals within C Compiler Version 5. The Configurable Logic Cell (CLC) module is a new peripheral that is supported by the CCS C compiler. The CLC module allows creating several different types of logic functions which are not limited by software execution speed. The CLC module can be configured into eight different types of logic cells including AND-OR gate, OR-XOR gate, 4-input AND gate, S-R Latch, 1-Input D Flip-Flop with Set and Reset, 2-Input D Flip-Flop with Reset, J-K Flip-Flop with Reset and 1-Input Transparent Latch with Set and Reset. Another new peripheral that is supported by the CCS C compiler is the Data Signal Modulator (DSM) module. The DSM module allows mixing a data steam, modulator signal, with a carrier signal to produce a modulated output. The modulator signal supplied to the DSM module can be generated internally from a peripheral, for example the UART peripheral, or supplied externally from the MDMIN pin. The carrier signal is comprised of two distinct and separate signals, a carrier high signal and a carrier low signal. Both of which can be generated internally from a peripheral, for example CCP1, or supplied externally from the MDCIN1 and MDCIN2 pins. Using this method allows the DSM module to generate Frequency-Shift Keying (FSK), Phase-Shift Keying (PSK) and On-Off Keying (OOK) modulation schemes. PIC® MCU, MPLAB® IDE, MPLAB® ICD2, MPLAB® ICD3 and dsPIC® are registered trademarks of Microchip Technology Inc. in the U.S. and other countries. REAL ICE, ICSP and In-Circuit Serial Programming are trademarks of Microchip Technology Inc. in the U.S. and other countries. Check out all the new devices supported and drivers in the latest compiler. 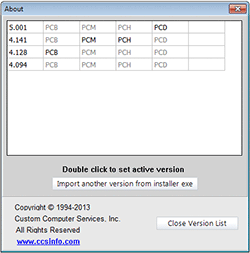 CCS IDE now supports MPLAB®X ICDs! CCS, Inc. a Microchip Premier 3rd Party Partner and leader in Microchip PIC®MCU development solutions announces, today, that the CCS integrated development environment (IDE) C Compilers now support MPLAB®X in-circuit debugger (ICD) and programmer solutions. This advantage allows Engineers the flexibility to seamlessly use Microchip, or CCS, ICD tools in the CCS IDE for 8-bit and 16-bit microcontroller debugging and programming. The supported Microchip ICDs include: MPLAB® ICD3, Real ICE, PicKit 3, and Microstick II. CCS requires that MPLAB®X be installed in order to take advantage of this feature. PIC® MCU, MPLAB® IDE, MPLAB® ICD2, MPLAB® ICD3, MPLABX® and dsPIC® are registered trademarks of Microchip Technology Inc. in the U.S. and other countries. REAL ICE, ICSP and In-Circuit Serial Programming are trademarks of Microchip Technology Inc. in the U.S. and other countries.